Within the next few minutes, you will receive a confirmation email for each of the upcoming webinars you registered for. 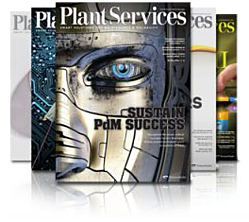 If you previously registered for Plant Services webinars, you will not receive a second confirmation email. Please email us with any questions. Our sister publications, Chemical Processing, Control, Food Processing, Pharmaceutical Manufacturing, Plant Services, and Smart Industry, offer a range of webinars on various industry topics, including IIoT, plant safety, automation, and much more.